Rice kheer is an Indian desert which is made from rice, milk and sugar falvored with cardamom powder, saffron. some time we use rose water or kevda water. 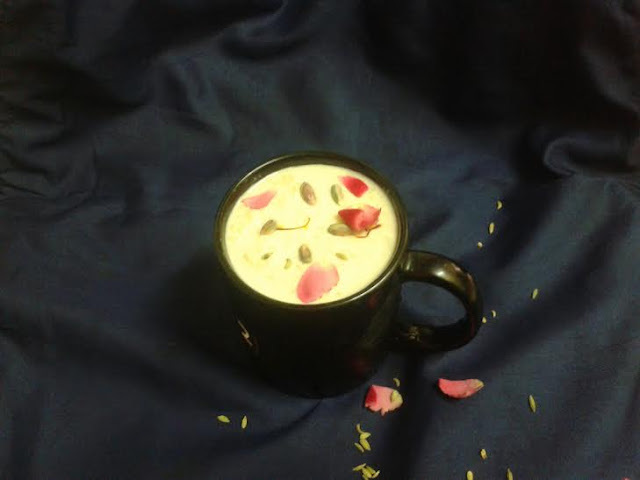 Thandai is a milk based summer drink. thandai is the perfect drink to serve on special days and festive occasions like Holi and mahashivratri. Prepared with a mixture of fennel seeds, almonds, poppy seeds, melon seeds, rose petals, black pepper, cardamom, saffron, milk and sugar. I made thandai flavored rice kheer. चावल की खीर हिन्दुस्तानी रसोई की मीठी डिश है जिसे चावल, दूध, चीनी और मेवे के साथ तैयार किया जाता है और खुशबू के लिए केसर, और इलाइची पाउडर का इस्तेमाल किया जाता है, कभी- कभी इसमें गुलाब जल या फिर केवड़ा जल का भी इस्तेमाल किया जाता है. ठंडाई दूध में बनायीं जाने वाली एक ठंडी ड्रिंक है, जिसे खरबूजे के बीज, खसखस, बादाम, काजू, पिस्ते, दूध, केसर और चीनी के साथ बनाया जाता है और अधिकतर होली के अवसर पर पेश किया जाता है, कुछ लो इसमें भांग भी मिलाकर सर्व करते है. Soak the saffron and thandai powder separately in Luke warm milk. Boil the milk , reduce the flame, drain the rice and add in the milk. Keep stirring it until it reduces to one third of original quantity. Now add sugar, milk made, cardamom powder, chopped nuts, thandai milk, and saffron. mix well and Cook for 5 minutes more, switch off the flame. 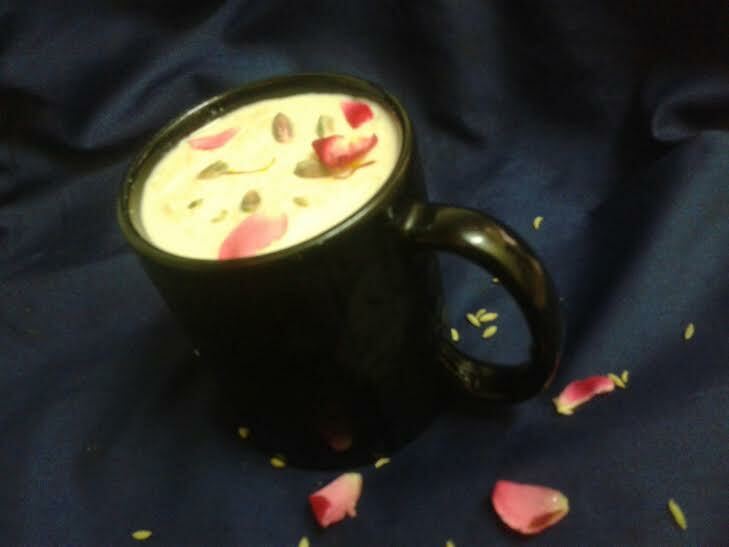 You can serve the kheer hot, warm or cold..
Before serving garnish with chopped nuts and rose petals .